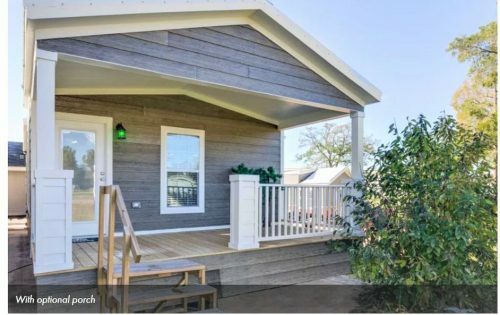 We have all seen the recent articles about the “Tiny Home Movement” and how popular downsizing and a more minimalistic approach is right now. 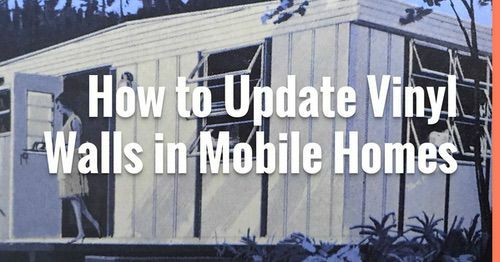 If you aren’t sure what the tiny home movement is, we found this interesting article that explains it fairly well. We’ve also included this great video of some of the most incredible tiny homes ever! 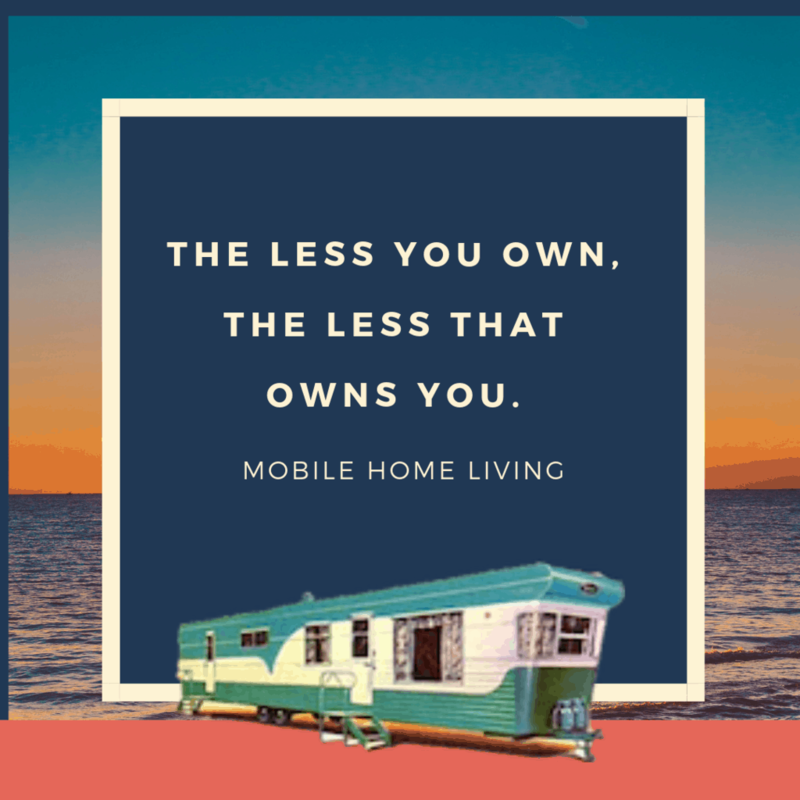 Of course, we are big fans of “less is more” here at Mobile Home Living. But, that doesn’t mean we don’t want to live in something fabulous, even if its tiny! So, we thought we would put together 3 of our recent favorite choices for tiny home designs that we loved. We’ve included the floor plan to each design that we found along with some of the images that highlight the reasons we loved them. 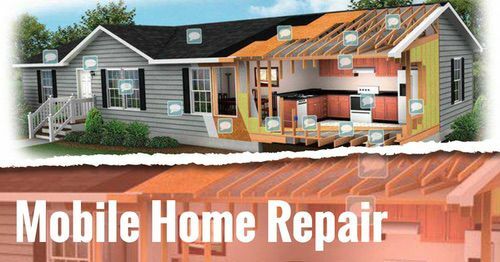 Please keep in mind that we are not affiliated with any dealers or builders so this is just our thoughts and opinions about the homes based on the images. 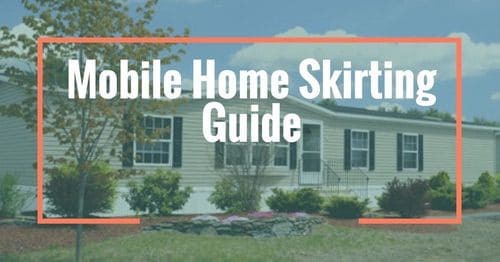 We just like to look at nice manufactured homes and talk about them. 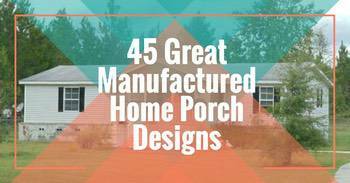 The Rustic Farmhouse design is very popular right now. The Alexander is a great representation of that look. The tiny home is only around 400 square feet but can accommodate 8 people with its creative use of space. Bunk beds, room for a queen size bed, and a loft space all provide plenty of sleeping room. 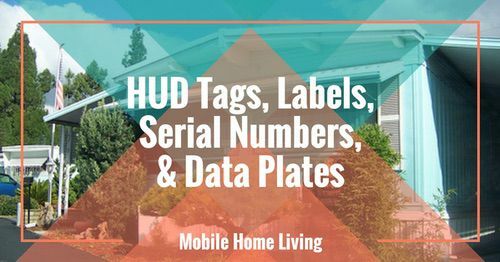 RELATED: How one mobile home owner transformed his kitchen into a rustic farmhouse kitchen. Bunk beds create more sleeping space. The finished look all set up. Hard to believe you can sleep 8 people in this home. We loved the layout of this tiny home. 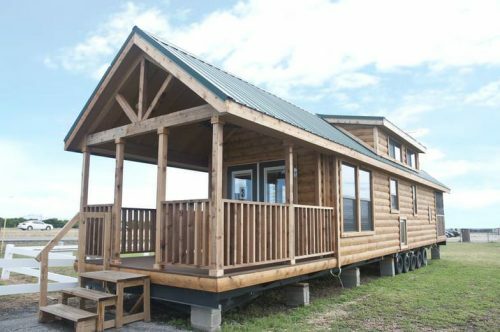 A little bigger, at 680 square feet, the Cimarron gives the illusion of even more space than that. We especially love the corner electric fireplace that makes use of what would otherwise just be dead space. 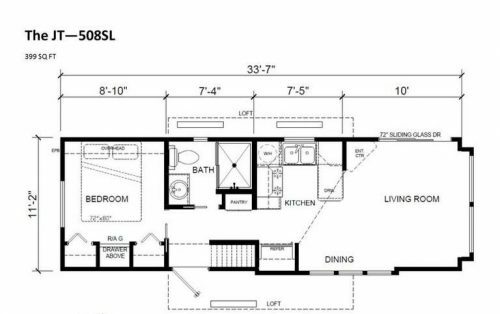 Lovely floor plan to create the illusion of more space. 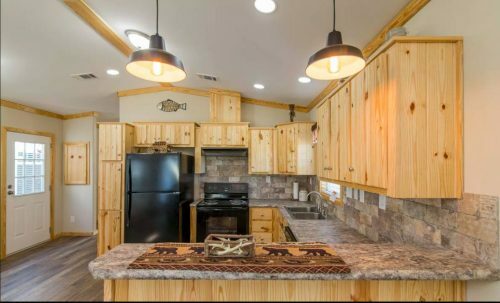 Look at all these cabinets. Plenty of room for some front porch seating. We would definitely want the available options. 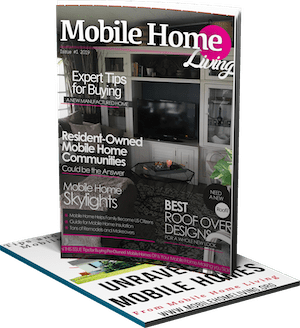 We have a soft spot for the Park Model homes, we have even written some articles on them in the past, most recently one about Park Model Homes we found in Oregon. 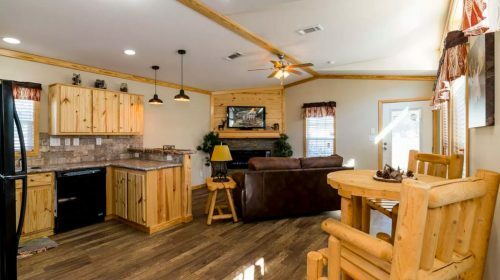 And, if you have always dreamed of living in a log home but never thought you could afford it, the JT may be just for you. 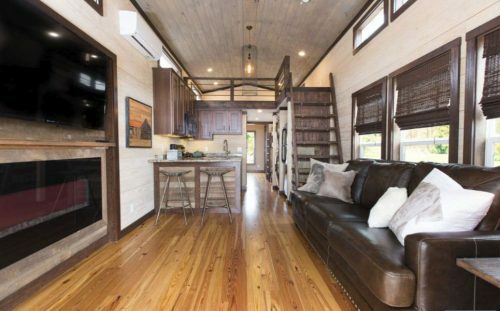 At right around 400 square feet, this tiny home offers plenty of storage and natural light. We can just picture this rustic beauty sitting somewhere secluded, the perfect weekend getaway spot or perhaps the perfect forever tiny home! We love the open loft above. 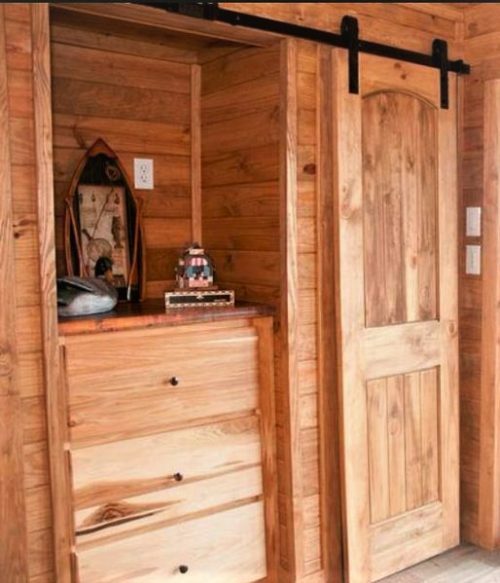 These barn doors make a great use of space. 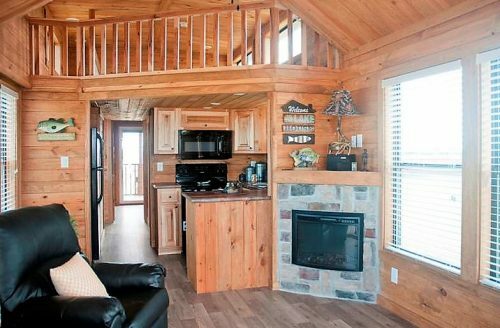 Rustic log house in tiny home form. The floor plan helps to show a clear look at the layout. 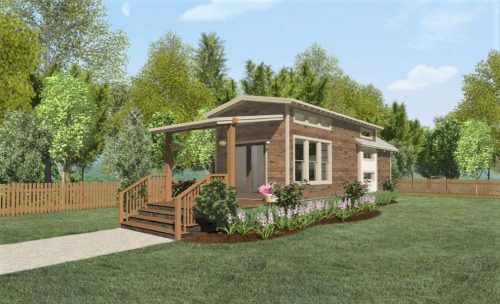 As you can see from these 3 tiny home designs, smaller doesn’t have to mean you can’t have all the great features of larger manufactured homes. 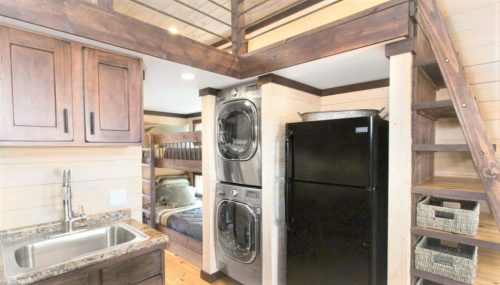 Plenty of storage, beautiful kitchens and plenty of room for the family make these tiny homes the next big thing.